Details at the end of this post on how to enter to win a copy of Bells, Spells, and Murders along with a link to purchase the book from Amazon, and an indie bookstore where a portion of the sale goes to help support KRL. Halloween isn’t the only holiday exuberantly celebrated in Salem, Massachusetts. In fact, the town is embracing the Christmas season with the theme of “Ring in the Holidays in Salem,” with Santas ringing on every street corner, bells decorating every store, and a musical bell performance by the Christmas Belles ladies. Even cat O’Ryan is adorned with a bell collar. WICH-TV investigative and new field reporter Lee Barrett has spent the day covering holiday community and charity events, with her next appointment set to interview the chairman of the Holiday Walk committee. It looks as though the rigidly punctual Executive Director of Historical Charities will be indefinitely late, though, as Lee has just found Mr. Albert Eldridge slumped over dead in his office. This is lucky number seven in the always entertaining Witch City Mystery series, as it seamlessly weaves paranormal aspects into what is definitely a novel for the Christmas season. There is even a snowy blizzard predicted by WICH-TV’s highly qualified if bosomy weathergirl to create the perfect frosty holiday setting. O’Ryan’s mischievous clue-dropping and Lee’s eerie mystical visions will please those who enjoy Wiccan elements, but what proves to be even more fascinating are the details of Lee’s investigative journalism. The nuances of crafting a timed-to-the-second video news shoot are genuinely compelling, as are the on-the-spot live broadcasts that must sound practiced but natural. The former late-night television “fake” psychic has finally come into her own, able to use her otherworldly gifts to enhance investigative reports while squeezing into a little Christmas shopping on the side. Completely irresistible is Lee’s Aunt Ibby, who before jetting off to London utilizes her librarian superpowers to research witnesses and track down suspects. Who could resist a mystery where home libraries are organized by the Dewey Decimal System, an Agatha Christie novel provides critical clues, and Gremlins is the holiday movie of the night? To enter to win a copy of Bells, Spells, and Murders, simply email KRL at krlcontests@gmail[dot]com by replacing the [dot] with a period, and with the subject line “bels,” or comment on this article. A winner will be chosen November 3, 2018. U.S. residents only. If entering via email please include your mailing address (so if you win we can get the book sent right out to you), and if via comment please include your email address. You can read our privacy statement here if you like. I have all the other books in this series and this one also sounds great. Thanks for the chance to win! Oh my goodness, I love this book cover! I forgot to put my email! Love this series, thanks for the chance to win. I own most of the books in this series and would definitely put a spell on you to add this one to my collection. Having the public library copy isn’t enough. This looks like a fun read. Thanks for this chance! new to me author. Thanks for the review. Being able to see visions on the surface of shiny objects would be an interesting gift. This book sounds enthralling and a wonderful series. Thanks. This series is new to me. 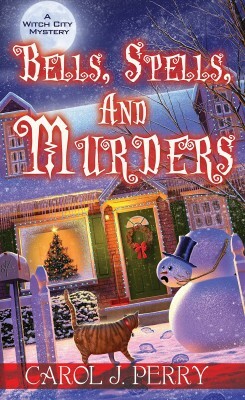 I’d love to win a copy of Bells, Spells, and Murder!!! I love the cat on the cover! I’d love to win!